It’s taken Artificial Intelligence (AI) some 60 years to move from a specialized silo within ‘computer science’ to become sufficiently mainstream in the last few years to infiltrate all industries and markets. What effects will it have on HR/ L&D in particular? Despite criticism of AI—from, among others, the celebrated scientist Professor Stephen Hawking, who warned that, over time, the development of fully sentient Artificial General Intelligence (AGI) (which is not currently available) could spell the end of the human race—businesses have begun to take advantage of machine learning to transform their strategies. Faced with AI’s recent rapid advancement after being so long in the scientific shadows, it can be difficult to separate the hype from reality. There’s a suspicion that leaders at all levels—including HR and L&D professionals—lack understanding of what AI can do. They need this understanding before they can position their organizations to be competitive in the face of AI-enabled competitors. It’s a similar position to the one that the business community was in some 25 years ago with the imminent arrival of the internet. A recently published Infosys study revealed that 76% of senior decision-makers say AI is fundamental to the success of their organization’s strategy. Moreover, by 2020, those currently using, or planning to use, AI technology anticipate it’ll boost their organization’s revenue by 39%, on average. Of interest to HR and L&D professionals is the finding that 80% of organizations that have replaced, or plan to replace, job roles by technology say they’ll retrain or redeploy those who’re displaced. According to the study, most organizations that have been using AI since 2016 don’t expect to achieve ‘mature’ AI adoption for at least another three years. Of those using AI, only 10% believe they’re fully maximizing AI’s current available benefits. Some 53% of organizations believe that ethical concerns stop AI being as effective as it could be. Nonetheless, 71% of respondents believe that AI is ‘inevitable’ and will be disruptive. Mary Meeker, of Kleiner Perkins Caufield & Byers, believes that large tech companies see AI as their core strategy and, so, what enterprises spend on AI will increase. She adds that we can expect this to happen in the learning world too, with AI tools and services being used across the learning journey from engagement, support, chatbots, content creation, content curation, consolidation, assessment, and wellbeing. Meeker says that AI is bringing increased personalization – maybe allowing everyone to access a unique, adaptive learning experience that suits their needs and progress, probably helped increasingly by chatbots. Moreover, since studies are showing that people are spending more time online—currently up to 5.9 hours per day on average—those wanting to find ‘learners’ will probably find them online. This should provide a boost to online learning. Meeker believes that data matters but big data really matters. Unfortunately, the learning world currently has relatively small amounts of data at the user, course and institutional level. Meeker says we should expect data advantages to be leveraged elsewhere in online learning, on a greater scale. However, as data becomes the new oil, oil leaks and spills also become a problem, so using data becomes more of a problem within the learning profession – providing a curious but real paradox. Averbook points out that AI is just one aspect of the much larger digital transformation story - and digital transformation is more than a technology refresh. It’s a total reload. Focus on creating a solid data set as well as data governance. Focus on user experience - reimagining how you deliver services to employees. Shift the focus from automation to digitization. 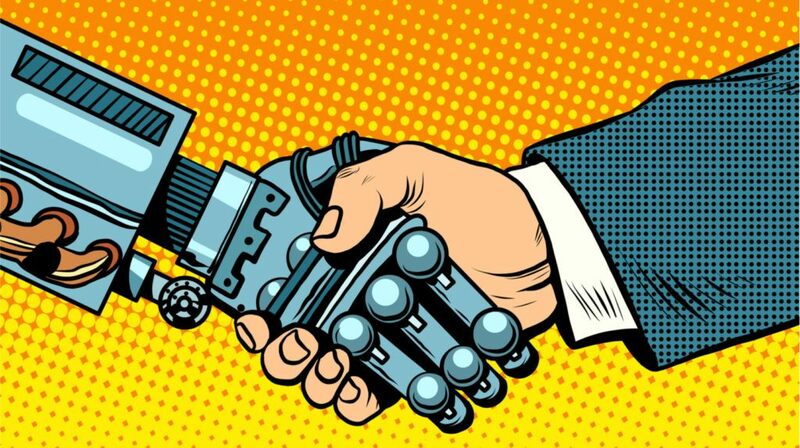 To leverage AI and bots and create new value, HR must move away from automating transactional work to changing the way HR works. This means that HR / L&D professionals will need new skills to take advantage of the digital workplace, and AI. Ian Shakeshaft echoes the sentiments of others in the importance of understanding that—since the fundamental basis for AI is data—the proficient collecting, cleaning, and processing of this data is key. With ‘good’ or ‘clean’ data, AI can be used to help discover what’s currently happening, what’s likely to happen, what competitors are doing, what customers want – and so on. Ian, a learning specialist and a member of the Learning Innovation and Impact Team at Financial Times | IE Business School Corporate Learning Alliance, is involved in the research, development, and application of new educational technologies and techniques – alongside sound learning design and pedagogical best practices. These technologies and techniques aim to improve learning outcomes and contribute to the success of all FT | IE Corporate Learning Alliance’s technology-enhanced learning initiatives. Ian believes that, while AI has major applications throughout the business world, in time its impact will also be felt in the field of L&D. eLearning may be said to have somewhat automated this arena – but the advent of AI provides opportunities for learning materials and the way they’re delivered to be more specifically adapted to the learners, and to continually adjust as those learners progress throughout their L&D journey. There are viable AI applications within HR / L&D, notably in the areas of recruitment as well as the awarding of educational certificates and professional qualifications. In these areas, AI has the potential to take out the inevitable human bias—be it conscious or, more likely, unconscious—from the process. As Ian points out though, the effectiveness of this, once again, comes down to the quality and integrity of the data upon which the AI is reliant. So, we must ensure that the foundational data doesn’t contain any pre-existing bias that could then, ultimately, be propagated. While the advent of fully sentient Artificial General intelligence (AGI) within our lifetimes is not an inevitability and, so, is still debatable; the complexity and capacity of AI neural networks—from their current ‘sub-human’ level, through to ‘pan-human’ capability—moves inexorably forward. Acknowledging that businesses tend of exhibit a ‘fear of change’, Ian believes that the way to overcome this fear where AI is concerned is through the implementation of small, quick AI projects—that is, ‘rapid prototyping’—to help allay workforce fears. It’s important for businesses to also address the ‘emotional aspects’ of AI – notably fears about the ‘de-socialising’ of work as large-scale workforces become less common; the need for continually re-skilling the workforce; and the economic and financial consequences of AI for both businesses and individual workers. The incredible potential of AI should not be just about increasing efficiency or removing people from the workforce to save costs. Rather, it should be viewed as a kind of societal evolutionary step in what can be called ‘Digital Darwinism’. Ian concludes that AI will lead to a change in the employment market. There will be fewer jobs—and/or less time required in current roles—for people to apply the type of ‘process-driven’ and administrative skills that computing can now do more effectively and efficiently. As a result, however, with this ‘free time’ on their hands, workers can—and should—look to practice and apply the kind of creative, problem solving, and critical thinking skills that will become increasingly valued. Speaking in Zagreb, Croatia, in 2016, Clark argued that automation was the key reason why jobs in agriculture fell significantly between 1840 and 2010. Employment in the manufacturing sector rose until around 1950 but has been declining since then. Jobs in the service sector are still increasing but, says Clark, it’s only a matter of time before the trend to automation hits this sector too. “A Harvard Business Review report states that 54% of what managers currently do is ‘administration’,” says Clark. “This administration is a prime candidate to be automated via AI. “Moreover, a study from the University of Oxford has suggested that some 47% of all current jobs can be automated. If that’s true, there’ll be some key issues as far as employment levels are concerned – and some areas of the world, such as Southern Europe, are experiencing massive unemployment now!